“Hello, My Name is Doris” (2016). Cast: Sally Field, Max Greenfield, Tyne Daly, Peter Gallagher, Beth Behrs, Stephen Root, Wendi McLendon-Covey, Elizabeth Reaser, Isabella Acres, Caroline Aaron, Natasha Lyonne, Kumail Nanjiani, Rebecca Wisecky, Rich Sommer, Don Stark, Kyle Mooney. Director: Michael Showalter. Screenplay: Laura Terruso and Michael Showalter. Short Film Source Material: Laura Terruso, “Doris & the Intern.” Web site. Trailer. Doris Miller (Sally Field), a sixty-something accounting clerk who recently lost the mother she lived with all of her life, leads a rather lonely existence. She spends most of her free time with friends Roz (Tyne Daly) and Val (Caroline Aaron) or secludes herself in the home that, over time, has become a hoarder’s paradise. That starts to change, however, when she has a somewhat flirtatious crowded elevator encounter with a handsome, new younger co-worker, John Fremont (Max Greenfield). Doris is quite taken with her colleague, and he shows her much attention. But is he genuinely interested in her, or is he just being friendly? Doris decides to find out. Doris Miller (Sally Field), a quirky, sixty-something accounting clerk without much of a life, seeks to rejuvenate her existence in the new comedy-drama, “Hello, My Name is Doris.” Photo by Aaron Epstein, courtesy of Roadside Attractions. With the help of Roz’s computer-savvy teenage granddaughter Vivian (Isabella Acres), Doris creates a bogus social media account as a means to befriend John. After he accepts the friend request she sends him, Doris looks to find out all she can about John and his interests. She soon starts listening to the same music he enjoys, as well as engaging in mutual pursuits. Before long they’re spending a lot of time together, both at work and socially. Doris is rejuvenated by the experience. She feels alive again. Her life seems to have meaning for the first time in decades. But is she correctly interpreting John’s behavior? Is she being realistic, or is she engaged in some heavy-duty wishful thinking? She frequently envisions grand and glorious outcomes for herself, only to have her hopes dashed when reality rears its ugly head – especially when John introduces Doris to his girlfriend, Brooklyn (Beth Behrs). 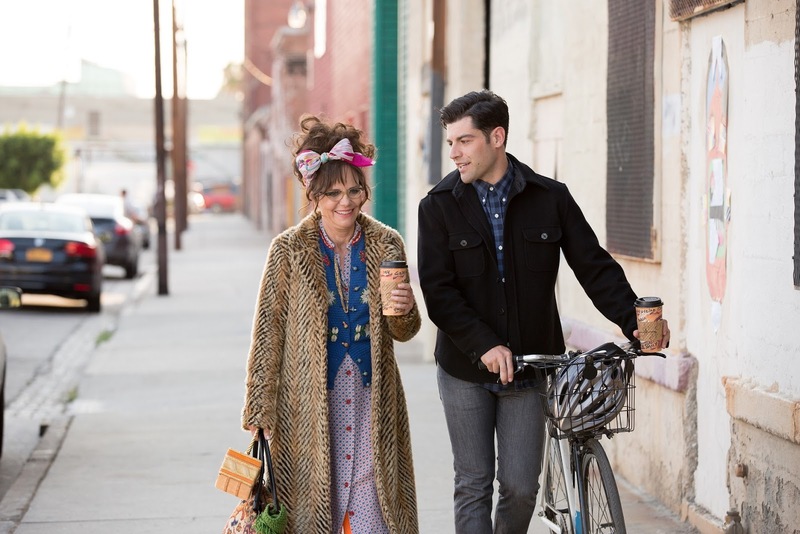 Doris Miller (Sally Field, left), an eccentric spinster, finds her life recharged when she befriends her new younger co-worker, John Fremont (Max Greenfield, right), in “Hello, My Name is Doris.” Photo by Aaron Epstein, courtesy of Roadside Attractions. Needless to say, Doris is devastated by the revelation. She withdraws and engages in behavior even more questionable than her typical quirkiness, developments that seriously trouble Roz, Val, Doris’s brother Todd (Stephen Root) and her counselor (Elizabeth Reaser). Almost as quickly as her life began to turn around, Doris is headed for what seems like a potentially catastrophic fall. Is Doris wrong to abandon hope, to give up her beliefs that change and renewal are possible? What’s more, isn’t it possible that there may be more going on than meets the eye? These are among the possibilities that Doris needs to discover for herself. As in many other recent films that have dealt with seniors seeking to rejuvenate their lives, such as “The Best Exotic Marigold Hotel” (2011), “Grandma” (2015) and “I’ll See You in My Dreams” (2015), “Hello, My Name is Doris” follows the lead of those pictures. It enthusiastically insists that it’s never too late to begin again, even if you think life has passed you by, something that distinguishes this release from its counterparts, which primarily focus on starting over after life-changing events. But, as in those other offerings, the key lies with discovering how to go about this. For many, embracing the principles of conscious creation – the philosophy that maintains we manifest the reality we experience through our thoughts, beliefs and intents – provides a powerful starting point. To make use of it, though, it helps to understand its capabilities, such as its potential to materialize virtually any result, its possibilities limited only by the nature of the beliefs we hold. The thrill of social media comes to life for eccentric spinster Doris Miller (Sally Field, right) when introduced to it by a friend’s granddaughter (Isabella Acres, left) in director Michael Showalter’s new comedy-drama, “Hello, My Name is Doris.” Photo by Aaron Epstein, courtesy of Roadside Attractions. With that in mind, then, conscious creation can be employed to realize a wide range of outcomes. Even the seemingly unlikely can become plausible through our manifestation beliefs. By eliminating limitations, thinking outside the box and envisioning previously unconceived possibilities, truly miraculous results can materialize. Indeed, if Doris genuinely wants to change her life, she should embrace these notions, regardless of whether or not her plans ultimately include John as part of the mix. So how do we recognize if we’re making any progress? This is where the importance of synchronicities comes into play. These meaningful coincidences offer us valuable clues that we’re on the right path toward making our dreams come true. They provide us just what we need, when we need it, as if tailor-made to our requirements (which, in actuality, they are, since they’re based on the beliefs we put forth and end up materializing in kind). And seizing the opportunities they afford can prove quite fruitful, taking us ever closer to where we want to be. Again, this is something that Doris should bear in mind. However, in interpreting synchronicities, we must do so accurately by making astute use of our intuition. The meaningful, though often-inexplicable impressions it provides give us a sort of emotional confirmation about what’s transpiring in our lives. To employ it to best advantage, though, we must first be sure to listen to it (something we’re often loath to do because of its seemingly illogical nature) and then heed its feedback correctly, primarily by avoiding the trap of wishful thinking. Failure to follow these cautions may cause us to miss out on valuable opportunities or to misconstrue their intended purposes. But these pitfalls can generally be avoided by approaching this process with a sense of integrity, primarily because our beliefs (and responses to them) typically operate most effectively when they spring forth from our own personal sense of truth. Fudging our interpretations or inappropriately bending them to fit hoped-for outcomes won’t serve us in the end, potentially leading us astray from reaching our goals. Embracing the truth in this way can be difficult, but this is not to suggest that we can’t get what we want, even if we’re prompted into taking some unforeseen or undesirable detours on our journeys. Such diversions may actually lead us to where we want to go, even if we can’t see that at the time they arise. But, if they’re in line with our integrity, it’s a pretty safe bet that they’re destined to lead to the fulfillment of our desired objectives. A heartbreaking moment for an aging spinster occurs when she meets the girlfriend (Beth Behrs, left) of a young co-worker (Max Greenfield, right) she has romantic designs on in the offbeat new comedy-drama, “Hello, My Name is Doris.” Photo by Seacia Pavao, courtesy of Roadside Attractions. The most important consideration in all this is that we take charge of our destiny and follow the dreams that we want, not those that society or others might try to dictate to us as a means to fulfill their agendas. Doris is often challenged on this front, especially when her counselor, brother and sister-in-law (Wendi McLendon-Covey) try to lay down the law to her. But, in her own special way, Doris ultimately knows what’s best for her, no matter how unconventionally she may go about it, thanks in large part to the advice of a motivational speaker (Peter Gallagher) whose books inspire her. By doing so, she lives the conscious creation principles that make her life – and its new look – possible. Despite some uneven treatment of certain plot elements and occasional lapses in character development, this entertaining, quirky comedy-drama delivers ample laughs and showcases a positively outstanding lead performance by Field (which, one can only hope, won’t get forgotten come awards season). Above all, though, the film offers inspiration to those who are well on in years and may have thought that life has passed them by. “Hello, My Name is Doris” proves it’s never too late for a new beginning, and it does so in a way that’s sure to leave a smile on your face. It’s heartening that the film doesn’t resort to treating its story as yet another cougar saga. Doris’s character is crafted more sensitively than that. Her quirky charms, though decidedly not the norm, make the protagonist seem like a real person and not a cliché. The filmmakers are to be congratulated for this, keeping the heroine from becoming trite or predictable. When faced with the prospect that there are fewer rather than more years ahead, we had better appreciate the value of this precious commodity. It’s not a time to squander this valuable resource on engaging in unrealistic pursuits, shelving cherished dreams or allowing ourselves to become reconciled to what we see as unchangeable stagnation. Rather, it’s an opportunity to reinvent ourselves, to start over and to make the most of what life has to offer.